Coaching soccer can be one of the most amazing opportunities in life. Developing young talent is one of the reason many coaches begin coaching to start with. However, staying on top of all the details and being organized can be daunting to any new coach. Whether a school coach or a local volunteer, keeping a correct roster is one those things that can be overwhelming. One of the most important things to keep up with is a handy reference to call team members when things occur in the schedule. The soccer roster template can be the answer to this problem for any coach on any level. The soccer roster template is free for every coach. It can be easily downloaded to the computer and begin using today. Keeping up with the roster is quick and painless. The roster is easy to change for each team’s needs. Follow just a few simple instructions and the roster will be available for many seasons to come. First, easily download the roster and save to a file on your own computer. It will be of great benefit to have a reference copy available. Second, put in the name of the team and the season into the soccer roster template. This roster should be saved under the team name for a quick reference to track the rosters. Third, adjust the fields for the particular data needed. Fourth, enter the names of each soccer player and the necessary data in each slot. First, since every team does not have the same players, keeping a blank copy allows adjustments to be made every season. Second, simplified tracking occurs when each team is saved under its particular team name and season. Third, maintain a copy available for any changes. Fourth, make any changes as soon as possible to the most accurate information. Coaching can be very fun. Developing young talent makes doing all of the other things worthwhile. 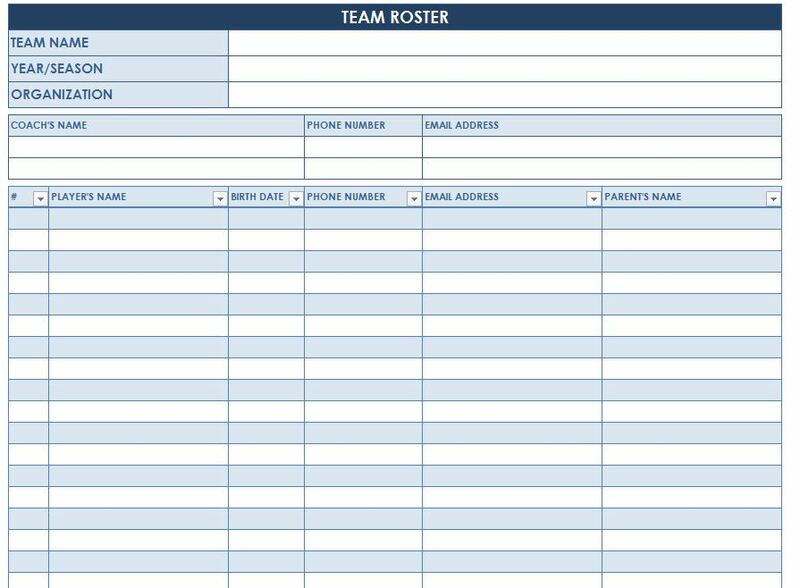 With the many things a coach must track, using the soccer roster template can assist with one of the things necessary to run a winning team.